and get it on your project! 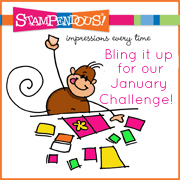 you get a chance to play along with us - happy stamping! wow... that large flower is great! it could even be a firework.... funny how we see different things in images. Love your card! so pretty, loving the glitter! Lovely card! The glitter around the edges is a fab touch! 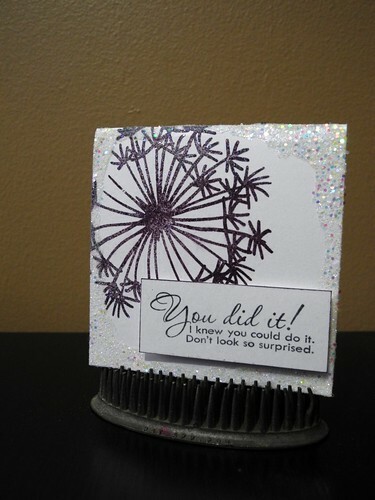 Love that BLING around the edges of your card! Yay for bling! Nice card with a fun sentiment. This is so pretty, Jennifer! I love the black and white with sparkle. That sentiment totally made me laugh! I love how you glittered the edges. I'll have to try that technique. That sentiment cracks me up! Love it! Love this and the sentiment is superb! Love the sentiment on that card!! And the glitter - oh my! You know I have a total stampy crush on your, right?!?!? Oh wow! Covered in bling looks fab! Your white glistening card is incredible! Love the challenge! oooooo...THIS is fabulous!!! Love the glitter!!! I hope you're having a good week!! Your cards are always so perfect! This is no exception. I love the glitter.